"Devotion inspires bravery, bravery inspires sacrifice, sacrifice leads to death, so... feel free to kill yourself." The Speaker was a Warlock and the head of the Consensus within the Last City; He was a very old Guardian, having lived as far back as the earliest days of the City. He apparently acted as an advisor and mentor to the Guardians, even adopting the Titan Saint-14 as his own son. The Speaker at one time also had an apprentice, Osiris, but in the end they became bitter rivals over their differences in philosophy, and eventually Osiris was exiled from the City. For this reason, the Cult of Osiris does not think favorably of the Speaker. The Speaker had a study in the North tower, where he sold legendary class items and emblems in exchange for Motes of Light. The Speaker also exchanged high-level upgrade materials. During the Red War, the Speaker was abducted by Red Legion forces and imprisoned aboard The Immortal, where he was interrogated by Dominus Ghaul. The Speaker served as a Warlock during the early days of The Last City, helping to build The Last City alongside Lord Saladin, Zavala and Lord Shaxx. After the destruction of the Iron Lords, the Speaker gained power in the Last City and established the Consensus (with himself as its head) and Vanguard to help keep order. He appointed his disciple and adopted son Saint-14 as the Titan Vanguard and Tallulah Fairwind as the first of many Hunter Vanguards. At the recommendation of Saint-14 and impressed by his actions at Six Fronts, the Speaker appointed the Warlock Osiris as both Warlock Vanguard and Vanguard Commander despite many rumors about his origins and the opposition of the Concordat, who claimed Osiris was the product of a failed Golden Age experiment mistakenly reincarnated into a human by his Ghost, Sagira. Years later, the Speaker declared the position of Hunter Vanguard vacant following the two-year disappearance of the current Vanguard, Kauko Swiftriver. Soon after, the Speaker and Osiris sent Saint-14 after the notorious Fallen mercenary Taniks, the Scarred after his murder of the Hunter Nian Ruo and several other Guardians. Saint-14 failed to find Taniks, although one of Nian's comrades, Cayde-6, succeeded and was believed to have killed Taniks, although the mercenary secretly survived the encounter. The supposed demise of Taniks elevated Andal Brask to the vacant seat of the Hunter Vanguard, as he and Cayde had made the Vanguard Dare over who would kill Taniks, with the loser becoming the new Vanguard. "Now that we have Consensus, I may inform you I have decided to banish former Warlock Vanguard Osiris from the Last City." As time went on, the Speaker and Osiris became close, with Osiris becoming the Speaker's apprentice, as the Speaker saw Osiris grow weary of ordering countless missions and dealing with the cryptarchs. The Speaker became increasingly concerned about Osiris' investigations into thanatonautics, Ahamkara-lore, Xûr and The Nine, as well as his questioning about the nature of Ghost reincarnation and the Traveler's motives, which the Speaker believed could disrupt the unity of the City and faith in the Guardians. Osiris began diverting Vanguard resources in his quest for answers, including launching an expedition to the Reef, and influencing other Guardians to abandon their duties in the City to pursue the same questions, which often led to their deaths. The Speaker decided to act after determining that Osiris had created a cult of personality around himself. After the Battle of the Twilight Gap, the Speaker decided to exile Osiris for his growing obsessions, particularly with the Vex, and misuse of Vanguard resources. At a meeting of the Consensus, the Speaker officially announced the exile and appointed Ikora Rey to take over as Warlock Vanguard and Commander Zavala as Vanguard Commander, with none of the Consensus objecting to his decision. Osiris and his followers, now known as the Cult of Osiris, left the City and disappeared across the solar system. The Speaker sent out Ghosts to gather information on his former apprentice, and those that returned only reported contradictory rumors. Eventually word reached the Speaker that Osiris had been spotted in the Caloris Basin on Mercury to investigate the Vex. After Saint-14 reported that he had killed Solkis, the Kell of the House of Devils, the Speaker congratulated his adopted son before informing him of the situation on Mecury. Concerned that Osiris would provoke the Vex into assailing the City so soon after the war against the Fallen, the Speaker dispatched Saint-14 to stop their former friend. "Nothing is more important now. We believe the Hive are engaged in a ritual that is draining The Traveler of its Light. Whatever power they wield must be understood... and destroyed." After a newly risen Guardian discovered the presence of the Hive in the Cosmodrome, the Speaker summoned them and explained his role and some of the history of the conflict between the Traveler and the Darkness. Disturbed by the Hive activity, the Speaker lifted the Lunar Interdiction and sent a Titan to scout the moon. With that scout failing to report back, the Speaker asked the new Guardian to follow his trail and discover what became of him. The Titan and his Ghost were found dead at the gates of a Hive fortress, but the Guardian managed to recover information from the dead Ghost. With this assault, the Speaker knew that the war against the Hive was about the begin once more and began preparing the City for it. The Speaker analyzed the information recovered and learned of The World's Grave, a location within the Hive's catacombs on the moon where they kept a repository of information. He once again dispatched the Guardian to raid the World's Grave and gather whatever information they could about the Hive and their plans for Earth. The Guardian learned that the Hive were conducting a ritual to reach out and disrupt the Traveler by draining its Light. Armed with this knowledge, the Speaker could now sense the dark ritual being performed on a shard of the Traveler. He ordered the Guardian to return to the moon to stop the Hive before they succeeded in their plot and brought an end to the Last City, and also sent out a high-priority message on all channels stating that halting the ritual was the Vanguard's most important task. The Guardian was successful, freeing the shard of the Traveler from the Hive's corruption, but during the mission they received a mysterious message from a Exo who requested they meet her on Venus. The Speaker thanked the Guardian upon their return to the Tower, noting that the Traveler, while still broken, had regained some of its Light. "For centuries, we feared the forces of Darkness massing against us. We sought to hide and cower beneath a broken god... No more. These Guardians show us what we are, what we have always been, and what we will be again. We are what remains of the Light and we will not be stamped out." 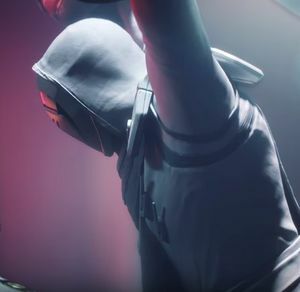 The Guardian learned from the strange Exo that the Black Garden was connected to the Vex and contained a threat to the City which prevented the Traveler from healing. The Guardian would require the aid of the Awoken in the Reef to find and enter the Black Garden. Concerned about the Vex and previous rumors about the Darkness that resided in the heart of the Black Garden, the Speaker allowed the Guardian to pursue this quest. He congratulated the Guardian after they killed the Vex Gate Lord Zydron in order to acquire its eye to access the Black Garden. However he warned them that despite Queen Mara Sov's assistance, she would likely have an agenda of her own and was not to be fully trusted. The Guardian broke into the Cabal's exclusion zone on Mars to discover the location of the gate into the Black Garden. The Speaker thanked them for reopening the Vanguard's access to the Meridian Bay and the lost city of Freehold and its Golden Age secrets, but again cautioned them on the Awoken's tactics. The Guardians successfully broke into the Black Garden and discovered the Black Heart at the center, guarded by the Sol Progeny. They destroyed it, bringing the Black Garden back into reality on Mars, which enabled Light to return to the Traveler. The Speaker summoned the Guardian back to the Tower, where he hosted a celebration for this great victory over the Darkness. Addressing the Vanguard, dozens of Guardians, and the citizens of the Last City, the Speaker proclaimed that they no longer had to fear and cower before the forces of the Darkness. The Speaker then met privately with the Guardian in his Observatory, noting that he had faith in the Tower, the Vanguard, the City, and in them while the Traveler remained silent. He thanked them for all that they had done for the City and all that they would do in the future. Despite this celebration, the Speaker noted that the Vex's power was not broken and suggested that the Guardian now turn their attention towards the Vault of Glass, as the Progeny were said to have been meant to bring dark powers forth from within it. "Perhaps you are still out there. If this reaches you, I would very much like to speak with you, to hear your theories in your own words. Perhaps what drives a Warlock to madness is truth." After the defeat of Crota by the same Guardian who destroyed the Black Heart, the Speaker was reminded of Osiris' warnings about the Hive god and wondered if his other warnings could be true as well. As he considered the evidence that pointed to his former pupil and his disciples still being alive and active throughout the system, the Speaker sent out a message to Osiris in the hopes that he would hear it and agree to meet. Despite his desire to meet with Osiris, the Speaker was still concerned about his former pupil's teachings and influence within the City. After hearing rumors that Lord Shaxx was a secret follower of Osiris, the Speaker launched a formal investigation into the Crucible handler. Shaxx was outraged by this, and sent a letter to the Speaker denying the accusation and defending his use of Osiris' belief that the minds and bodies of Guardians could be sharpened like one sharpens a sword, declaring that the results in the Crucible as proof enough that the exiled Warlock was correct on that at least. "It would save us a lot of time if you would just kill me." "For one who calls himself "Speaker" you have remarkably little to say."" On the anniversary of the Battle of Six Fronts, the Speaker was preparing to give a speech when the Last City was suddenly assaulted by the Cabal's Red Legion. The Tower was the focal point of the Legion's assault, and despite the efforts of Ikora Rey, Lyria Graemer, Mattox-9, and The Guardian, the Speaker was captured in his quarters and imprisoned aboard Dominus Ghaul's command ship, The Immortal. While the Red Legion worked to complete the Traveler's cage and learn how to extract its Light, Ghaul interrogated the Speaker on the nature of the Traveler's favor and how to gain the Light as the Guardians did. The Speaker eventually reveals that although he claims to speak for the Traveler, he never said that the Traveler actually spoke to him. After The Almighty was deactivated, The Consul had become enraged with Ghaul. He released the Speaker against the wishes of the Dominus, and subsequently crushed his mask, frustrated that Ghaul would heed the Speaker's advice over his own. The Speaker's fate after being released from the restraints is unclear, but could be presumed that he succumbed to his injuries and died. Following Ghaul's defeat, Ghost notes that although the Speaker is gone, he was not the first to hold the title, and may not be the last. Calm, visionary, wise and compassionate were among the best words to describe the Speaker. The Speaker wholly believed in the Traveler as the savior of humanity in its darkest hour and never doubted in its decision to create the Guardians to protect people in its place. For this reason, the Speaker looked to guide Guardians on the right path in protecting the Last City from the forces of the Darkness. He became something of a mentor to some to even a father figure to the Guardians, Saint-14 in particular, whom the Speaker loved like a son. The Speaker proved his leadership capabilities during his younger years, gathering many survivors and Guardians to lay the foundation of the Last City for the purpose in providing a safe haven for the survivors of the Collapse. As he became the leader of the Consensus, the Speaker pressed for unity amongst the factions and citizens. For this, the Speaker will not stand for any voice or force that seeks to topple the order in the Last City or speak of the Darkness in any way other than a force to defeat. Perhaps the only time he lost his calm demeanor was during his arguments with his former student Osiris. The Speaker resented how Osiris began to question the purpose of the Guardians and more so on the nature of the Traveler. In addition, he was repulsed with the morbid warnings of the Hive spoken by Eris Morn. There were times when the Speaker would hold a grudge, which he did infamously with Osiris. At first, they were friends as teacher and student but the growing debate on the Light, Darkness and of the Vex threat did their arguments grow more heated and bitter. When Osiris's work began to be distributed through the City as "holy texts" and cause divisions between the Guardians, did the Speaker believe that enough was enough. The Speaker denounced Osiris as a heretic, demonized his work and exiled him from the Last City. As as result, the Cult of Osiris do not have a high opinion of the Speaker. However, the Speaker was not above making attempts to make amends as he sent messages to Osiris to speak with him but unfortunately, none reached him. Though the Speaker is aware that by the time the Guardian rises, times were starting to become bleak and is saddened at the loss of so many Guardians and of the dwindling hope for the system. However, thanks to the Guardian's successes throughout the system did he feel joy at the Last City being at peace and was ever thankful that they had taught him to hope again. When the Red Legion invaded the Last City and was personally captured and brought before Dominus Ghaul, did the Speaker prove to be strong-willed and defiant. Even when brutally threatened and tortured by the Dominus, the Speaker remained faithful to the Light and of the hope that the Guardians will prevail. However, his time as a prisoner to Ghaul led to unique interactions, almost as a teacher of sorts, speaking of how the Traveler chose humanity and what it meant to be a Guardian. In time, the Speaker admitted that while he may speak for the Traveler, he never said that it had spoken to him. Nonetheless, his belief in the Light, the Traveler and the Guardians was validated when they succeeded in defeating the Red Legion, destroying Ghaul forever, liberating the Last City and awakening the Traveler. "An ancient scholar of the Traveler, the Speaker keeps special items for Guardians who explore the Light's mysteries." All Class Items sold by the Speaker cost 25 Motes of Light and 60 Legendary Marks each. Two for each class are randomly selected for sale every week, with randomized stats and perks. The Speaker also sells a selection of Rare Ghost Shells for 810 Glimmer each. They are set at levels 34, 36, and 38, and are capped at 190 Light. These same Ghost Shells also have a chance to randomly drop as loot, and can have any Light value up to 300. "The Light lives in all places... In all things... You can block it... Even try to trap it... But the Light will always find its way." "Devotion inspires bravery, bravery inspires sacrifice, sacrifice leads to death, so feel free to kill yourself." "The Darkness is coming back. We will not survive it this time." "Your mission is vital, Guardian. If you succeed, you will become legend. If you fail, this city will fall and the last light of civilization will go out." "If they find it, can they contain it?" "Something vast is arising before us, or, are we falling towards it?" "It is dim, but it can be wielded, shaped." "What ever hides in plain sight is making its own plans." "The Wolves are near, she is a fool to think she can control them." "And silence still. Nothing but silence." "It's no time for questions. We must be bold!" "Not Light, but not Darkness. Something else?" "None are light, or, each one of them is guilty." "Perhaps now the vaults can be destroyed?" "Silence still, and the Darkness moves closer." "But we are stronger now." "What happened there? Can we use it?" "Something powerful is down there. I can feel it." "There must be a way to find it to bring it back." "Nothing. We will try again." "We cannot give up hope." "Even an ember still burns if it can be stoked." "(Sigh) No, we aren't ready." "Bring it back here. Let us see it." "We shall see. Thank you." "He is too weak. Let him rest." "Still, there is more for you to do." "No -- it can't be true." "When our light is stronger. Not now." "There are more still out there." "Then they are vulnerable. Good." "She is powerful. But not invincible." "Do not stop. You must return." "Are you certain? Tell me where." "Stay away -- it is a dead zone." "What have you found? Oh." "There is still so much more ground to cover." "I fear so little remains." "No. No -- that isn't right." "There was nothing more you could have done." "But she -- she was strong." "At last! The way seems clear to me." "Good news comes often these days." "Perhaps I can rest now without worry or fear." "I feel a storm approaching." "I know you are with us." "I hear the echos. Your voice lingers." "Have we done all you wanted?" "You will return to us. I know it." "Let me hear your voice. Just one more time." "Faith allows us to carry the heaviest of burdens." "Our Light is stronger now. We have overcome so much." "There have been times I have feared the Darkness would consume us all." "Atheon, Crota, Oryx, Aksis. So many Champions of the Darkness and you conquered them all." "I thought the Taken would overwhelm us, but we are stronger than they knew." "I look back at all the challenges we have overcome and all I can think of is what lies ahead of us." "We have come so far, but there is farther still to go." "We are all the same under the Traveler." "We are called to do what the Traveler cannot." "The Traveler is our past. The Light shapes our present. It will be our future." "Eva was right. We can never lose hope." "Zavala's face is unshakeable. I will rely on him." "I never thought I would see the City at peace. It is so beautiful." "The stories the children tell now are joyful ones, full of kindness and bravery." "I have watched over this City for centuries. So much as changed." "I walk the streets of the City and they do not speaker of the Traveler now. They look to the Guardians to save them." "I hear the whispers. Those who say the Traveler is lost to us. Those who have lost faith." "Not all of them seek the Traveler's guidance now." "The number of believers grows fewer every year." "I'd hoped we'd find more relics by now, but the battles leave little time for exploration." "There are Ghosts searching the Dead Zone. Perhaps they'll find something there." "There are survivors out there. Not all of them want to join us beneath the Traveler." "More reports of signals from deep space. Trouble." "There are rumors that the Shard still exists. I feel its pull." "The journey will be dangerous, but if we could find the Shard..."
The Speaker is voiced by Bill Nighy. Prior to Update 2.0.0, the Speaker sold a selection of Legendary Emblems for 7 Motes of Light apiece. After the update, these Emblems were moved to Eva Levante's rotating inventory. He is a Guardian, and helped to establish the Last City alongside Zavala and Lord Shaxx. The Speaker is a Warlock. The Speaker's true appearance/face was never revealed. Scannables in the Tower state there has been more than one Speaker, and that the newest was not the last. The Speaker and a Guardian within the City. Speaker talking to The Guardian. The Speaker and a Ghost. A close up of the Speaker. A younger speaker, during his time as an active Warlock, celebrates the establishment of The Last City.